The Ashcroft Alliance saga has entered another tedious, taxing chapter. The latest move by the Alliance is that it has assigned the British Caribbean Bank's 50 million dollar arbitration award to Midway, a company registered in British Virgin Islands. The government disagrees but the court sin the US have granted the application so Midway was able to replace the British Caribbean Bank. Today, we asked the attorney General if this means that they can go after Belize's reserves:..
"What the Ashcroft Alliance has done they assigned their rights in BCB to a Midway, which is a British Virgin Islands outfit type of thing, similar Ashcroft type of company and we objected to that assignment, saying that essentially the issues wouldn't change, essentially the merits of that case have been decided upon. So really what are you trying to do? You're trying to hide behind a name. In their ultimate wisdom the courts in the US granted them that application that they won. So Midway was able to replace BCB. Where does that leave us? We have no jurisdiction over midway and we believe that it is not a sound decision but I have a conference call with our US attorneys on Tuesday and then we will strategize as to where do we go from there. Do we want to appeal that in a US court?" "Of course there is the concern that they would want to say that the government and the central bank are one entity and the central bank does have assets outside and they would no doubt try to attach those assets. However, our lawyers abroad are telling us and we firmly believe as well that absolutely there is no court in its right mind that will say that central bank's assets and government assets are the same thing, because they are not. So that's the only way we could be exposed, but I don't think that they would meet with much success with that one, or at least I hope not." "Now there is always a thing called litigation risk. But upon the reserves there can be risk because the reserves are the bedrock of the economy." "At the end of the day we have a responsibility to protect the assets of Belize and our highest court has said that those agreements that you entered and those situations that you got into with the previous government were illegal. So we cannot honor whatever you are asking. So we will never honor that, because in our mind if our highest court has said that you are not due any of those awards, then that's our position." "As someone with experience in the courts, when you reach into a corner and you can't risk even the corner, shouldn't you seek a settlement?" "We don't negotiate with terrorists and he is behaving like one, so he has to know that we will fight him to the end." 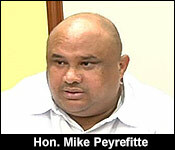 As Peyreffitte noted, Government will discuss its options with its US law firm next week.